Tatsoi is an Asian green belonging to the brassica family (broccoli, kale, Brussel Sprouts, collards). It is often found in farmers’ markets and green grocers, just harvested in hand-sized bouquets of several heads. Very dark green spoon shaped leaves, grow outward from the succulent stem in attractive rosettes – you’ll see why it is also called rosette bok choy and as well as spoon cabbage. Some describe the taste of the leaves as being like swiss chard with a mustard edge. Stems are sweet and succulent. It can also be sprouted or grown as a microgreen. It’s beta carotene content is pretty high and it is packed with vitamins A, B, C, E and K. It also contains calcium, iron, potassium, zinc, magnesium and of course chlorophyll. 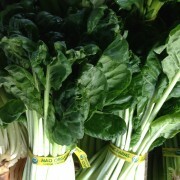 It grows well in Hawaii climes, is often found in Chinese and Japanese recipes. – Always wash your tatsoi well before cooking. Wash like you would spinach. – It can be eaten raw in salads, added to smoothies or juiced. – Tatsoi is also nice warmed and wilted in salads. It is a fast green addition to any meal steamed, stir fried, and thrown with noodles and soups at last minute. Select bunches free of holes, yellowing leaves, wilt. Store unwashed in plastic bag in refrigerator up to 2-3 days in veggie bin as they are pretty fragile and can get chill damage easily.